bajawales01, originally uploaded by cambrianbiker. …something stirs! Thanks to Cambrianbiker on Flickr for this one. Baja GB this weekend was a phenomenal experience. The stages were like nothing I’d ever done before. Normally our stages are 32 km max, the usual rally stage is less than half that, but the stages this weekend were 50 and 60 km! We had one stage to do on the Friday, a 10 km prologue that would determine our seeding for the next day. We started really well, with a few changes to the feel of the vehicle with the extra weight (two spare wheels and a whole lot of fuel!) making it seem a little wallowy but Henry adjusted accordingly and we were flying. Part way through MuddyMoo had a couple of misfires, then after a 90 left and part way uphill she stopped on stage and wouldn’t restart. We had to roll back down the hill, get clear of the stage, then Henry was straight out of the vehicle and sorted the problem (a plug lead came off) whilst I put out our OK board. Henry quickly had the problem sorted, so grab the OK board back, jump back into the vehicle, get the belts back on and frustratingly Frazer Williams and Dave Thomas went past in the QT before we got re-started. We lost about two minutes, which put us at the back of the field for the next stage, really gutting. Back to service where our special guest service crew David and Michael (thanks lots both of you, your turn next year!) investigated the smell of oil, dodgy steering and the loose jack handle somehow floating around the back of the vehicle! So we rallied through the final stage, finished close but still 31 seconds behind Frazer and Dave (congratulations guys! ), and absolutely thrilled with third national position! We were presented awards in front of spectators and photographers, and it all felt rather special. Now it’s back to normal life but with a huge grin and some amazing memories flying through my head. Thanks to all the organizers, officials, marshals and spectators for making it so much fun, thanks to Mr. and Mrs. Webster the Muddy Moo Management Crew, to the wonderful Roland Marlow for all your help, and to my husband Richard for the competition, the support, and for not landing on our roof on stage 4! Thank you to Allmakes for the sponsorship, and last but not least, thanks to Henry for driving so fantastically and letting me shout at him for three days! Some video of us overtaking Ben Gott on the long climb in Sweet Lamb/Hafren. Thanks for letting us past Ben, sorry about your fuel problems. Pity I made a bit of a horlicks of the overtaking manouevre! Still didn’t lose us too much time. Thanks to DavesTaxi on www.BritishRally.co.uk for this one. 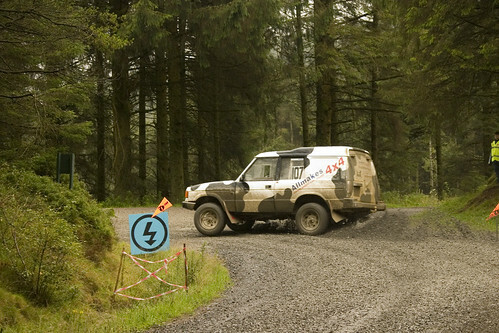 After 625.82 kilometers of high speed action in the Welsh forests, the Friesian Racing team with their distinctive Land Rover Discovery, ‘MuddyMoo’ missed out on second place by a mere 30 seconds. “We’ve done especially well when you consider that the sport is dominated by specially modified vehicles. 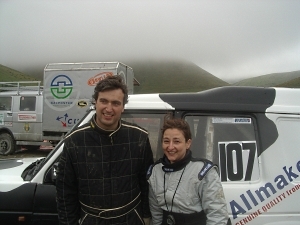 To get on the podium with a Production Class car is virtually unheard of!” said Co-Driver Sarah Suter (Chepstow). The event was not without its challenges for the whole Friesian Racing herd. Having missed last year’s inaugural event, thwarted at the last minute by engine gremlins, the team found themselves in a similar situation this year. With just minutes to go to the technical scrutineering MuddyMoo wouldn’t start. The service crew (largely new for this event!) worked wonders to get the car running and into the event on time. The king ignition lead came loose on the opening SuperSpecial stage in Radnor Forest forcing a stop to reattach it and relegating them to the back of the national field. The fight back started on the first stage of day two, the first of the true Baja stages (a 60.97km test in Hafren Forest and Sweet Lamb), where the team overtook five cars to claim the third fastest time. A similar feat in the third 54.64km test brought the team right back into contention. This was a truly punishing stage which threw everything at the teams, from river crossings to deep mud, steep climbs to precipitous drops all mixed in with lots of fast gravel tracks. Disaster struck on the second loop of stages. Two thirds of the way through the second “Sweet Lamb” stage a brake line fractured leaving the crew with no brakes. Nursing the car nearly twenty kilometers to the end without brakes, the team were then able to block off the offending pipe and drive the “Tarenig” stage with an ill handling car with braking effort on just three wheels. Once fixed at the overnight halt, the team were able to claw their way back onto the podium in the remaining two Sunday tests. Starting nearly two minutes behind the second placed car of Frazer Williams and Dave Thomas, Henry and Sarah flew through the final kilometres to reduce the gap to a mere 31 seconds by the end of the event. “Getting to the end of an endurance event like this is an achievement in itself, but to do so and to finish on the podium was beyond our wildest expectations! It is a credit to the quality of the parts supplied by Abingdon based Allmakes 4×4!” said Henry Webster at the end of the event. Picture says it all, we’re chuffed! Picture says it all, we’re chuffed!, originally uploaded by friesian_racing. Again too late and too fatigued for the full post tonight, but suffice to say that the pic says it all and we’re chuffed to bits after a fantastic weekend. Quick thanks to Ronnie and Nigel – my parents, service crew David and Mike – all of whom have worked miracles this weekend. Andrew for his time and patience in the build up and of course my long suffering navigator Sarah who did us proud on this event. Also thanks to Allmakes and Dave Bellamy in particular! I would also like to thank the organisers and officials (including all the marshals) who braved the elements to put on a superb event. We enjoyed it immensely. Middleton Stoney based Friesian Racing are set to enter the Baja GB this weekend. 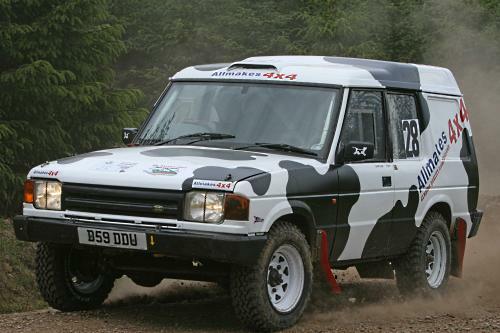 Fresh from their success on the recent Scottish Perthshire Hillrally, the team will be competing in their distinctive ‘cow’ liveried Land Rover Discovery, known affectionately as MuddyMoo! Driver Henry Webster (Middleton Stoney) and co-driver Sarah Suter (Chepstow) are currently leading the Super Production class of the Matador National Hillrally Championship in their bid to hold on to their title for a third year in succession. Last year the pair helped out with the organisation of the BajaGB in its inaugural year. Sarah Suter is daughter of Chris Tomley, chair of the organising committee for the event and Henry has been involved behind the scenes with the British Off Road Championship for the last seven years. This year they are spearheading the UK assault on the event. “We are over the moon to be joining the international entries on the list for the UKs most important off road event, but we couldn’t have made it without the support of Allmakes 4×4!” said Henry Webster. 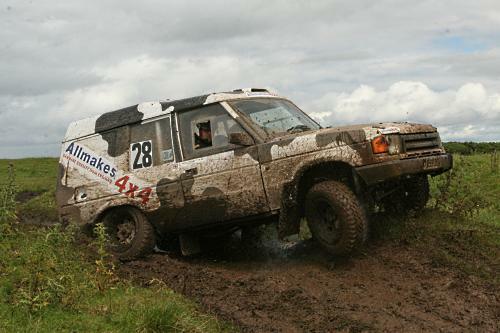 Friesian Racing have secured the support of local firm, Abingdon based Allmakes 4×4 for the 2007 season. The Allmakes Group specialise in the supply of high quality Land Rover parts and accessories. “Allmakes commitment to quality parts will mean that we have the best chance of staying reliable in this endurance event. With the help of Allmakes spares we were able to finish the notoriously tough Scottish Perthshire Hillrally in July with no real mechanical problems.” said Henry. 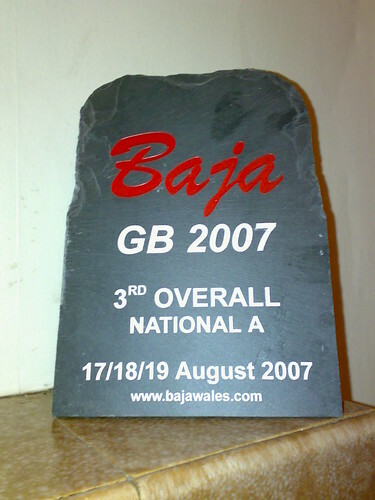 The Baja GB comprises some of the longest competitive stages ever held in the UK. On occasions the Friesian Racing crew will be driving on competitive sections for in excess of 60km. A true endurance event, at 625 kilometres the route for the BajaGB is almost twice the length that the Friesian Racing crew are used to on the National Hillrally series events and as such the event is a useful stepping stone to major international rally raids such as the Dakar Rally. The BajaGB also welcomes bike and quad competitors, unusually allowing two and four wheel competitors to compare themselves to each other. Cross Country Bajas: The first Bajas were run in the Baja California Peninsula in Mexico in the late sixties. These gruelling off road races were the highlight of the American off road calendar and one of the toughest international events. The American Bajas are still run annually in the autumn. More recently the term Baja has been used in Europe and Africa to describe tough, but compact off road endurance rallies (also often referred to as Rally Raids). The FIA International Cup for Cross Country Bajas includes rounds in Italy, Spain, Portugal and now the UK. BajaGB: The event will start at the Royal Welsh Showground in Builth Wells on Friday, August 17th. Cars will then tackle a 10.00km timed super special stage in nearby Radnor Forest from 16.38hrs. Friesian Racing: We are a small enthusiastic motor sport team, who compete various UK off road racing events on a tight budget, but with a professional outlook. 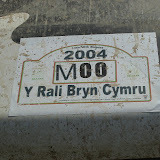 The unusual team name comes from the cow coloured liveries that team’s car sports in its racing campaign. Initially this was just chosen as a cheap way to cover up bad paint finish, but it has proven such a hit with the team and our fans, that it is now a permanent fixture and has become the team motif! The core of the team comprises Henry Webster – Team principal and driver, Sarah Suter – Co-driver and MuddyMoo their faithful rallying Discovery. Friesian Racing will be competing in the National section of the Baja GB in 2007 and currently lead the Super Production class of the Matador National Hillrally Championship.